Why would I need self storage in Akron, OH? There are a variety of reasons why you might need self-storage in Akron, OH. How much is a storage unit in Akron, OH? The cheapest storage unit in Akron, OH is $29.00 per month. What size storage units do you have available in Akron, OH? In Akron, OH we have sizes that range from 5'x5' to 10'x30' to suit your storage needs. How much is it for a 5'x5' storage unit in Akron, OH? The cheapest 5'x5' storage unit in Akron, OH is $29.00 per month. 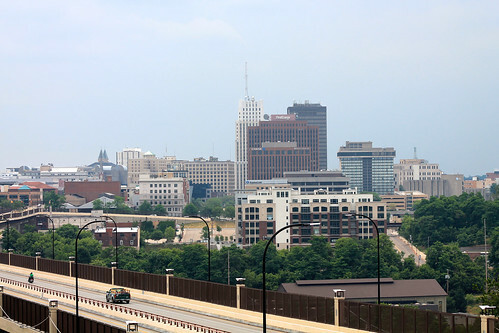 Akron is a major industrial center and the hub of the United States rubber industry. The city houses the corporate centers for Goodyear, GenCorp and Uniroyal-Goodrich which provide a large number of jobs in the area. Although its population growth has leveled out in recent decades, Akron remains one of the largest cities in Ohio and an important part of the Cleveland-Akron-Canton metropolitan area. You'll find plenty of attractions to explore in the city including the Akron Art Museum, the Akron Fossils & Science Center and the Akron Zoo. Arts and culture can be found at E.J. Thomas Hall, the Akron Civic Theatre and the Lock 3 Park Amphitheater, all of which regularly host a variety of musical and theatrical performances. In 1811, the first city planners arrived in the area that's now Akron with the goal of establishing a simple settlement for workers on the nearby Ohio Canal. By the mid-1800s, the small community had blossomed into a thriving village, earning prosperity from the stoneware, sewer pipe and fishing and farming equipment industries. Between 1850 and 1900, Akron was witness to important historical moments and significant growth. Women's rights activist Sojourner Truth delivered one of her most famous speeches at an Akron convention in 1851, and the University of Akron (originally called Buchtel College) was founded in 1870. The modern-day toy industry was born in Akron in the 1880s, with local inventions including clay marbles, the rubber duck, dolls and rubber balloons. As Akron evolved, so did its economy. In the late 1800s, Akron became the Rubber Capital of the World with the arrival of major companies like Goodyear Tire and Rubber Co., Goodrich Corp., General Tire, and Firestone Tire and Rubber Co. The city's population exploded with the arrival of workers from all over the country, and the corporations quickly established large communities for their employees. Today, as the demand for rubber has slowly decreased, Akron has turned to polymer production and research. Rubber remains a powerful force in Akron's economy, but it is no longer the sole source of jobs and income. Today, the city has a diversified economy, with health care, manufacturing, chemicals, retail and polymers playing important roles. Among the city's largest employers are Summa Health System, Akron General Health System and the County of Summit. Barberton is an extended suburb of Akron, home to many residents who commute to the city for work every day. During the 1800s, it earned the nickname "Magic City," thanks to its rapidly growing population that many people felt had simply appeared by magic. Munroe Falls is a scenic corner of the city, with a family-friendly vibe and a tight-knit community. Here, you can enjoy a small-town atmosphere that includes ice cream socials and summertime farmers markets. Cuyahoga Falls is the site of several of Akron's natural attractions, including the Mary Campbell Cave. This small natural rock shelter was the temporary home of Mary Campbell, an early American settler. Fairlawn was first established in 1891, when the Northern Ohio Railway brought new residents and business to the area. Today, it's grown into a small but active community offering a variety of local programs including nature education, group hikes and children's science programs. The Akron City School District manages all public education in the city, including preschools, elementary, middle and high schools. There are also a handful of charter and private schools. You can enroll your child in a faith-based school or one that offers specialized study tracks in STEM or the arts. If you're interested in attending college in Akron, the largest campus in the city is the University of Akron. Utilities: Akron's main electricity provider is Ohio Edison, while the City of Akron manages water and sewer services. Garbage and Recycling: Your trash and recyclables will be collected curbside, with your specific location determining your pick-up schedule. Transportation: The METRO RTA provides public transit in the Akron area, and also offers a few routes into nearby cities as well. Snow Control: Akron regularly receives significant snow in the winter months. The city will provide snow removal services when the snow depth reaches six inches or more. The median home and rent prices in Akron are well below the national average, and also fall just below Ohio's averages. You'll find a variety of affordable options whether you are looking to rent or own, as Akron's diverse neighborhoods offer a range of styles and home sizes. Our lowest priced units in Akron, OH average $29.00 per month. 124 people have reserved units in Akron, OH in the past 30 days. There is 1 location within Akron, OH's city limits. There is 1 location in Akron, OH that offers AC and Heating features.